In bringing the new blog over, I found this old post that I never published. I’m publishing it now. Only 5 years late. 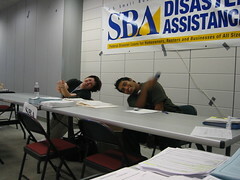 Ok, so we got in trouble for taking pictures in the Disaster Relief Center, but do you see any patrons? We weren’t cataloging the folks getting aid, we’re just trying to show our friends and family back home where we work. That’s all. Here’s Wake-Me-Up-For-Work-Manny and Great-Parking-Job-Heather hanging at the end of the day. We only get slow at the very very end. In this case, only in the last 5 minutes. It was the busiest day ever! We think we topped our record. Heather must have seen a dozen people, I saw at least that many. Poor many I think saw…. one. All day long.